The Guardian newspaper reported this week that British Defence Minister Gavin Williamson had planned to bring forward legislation to stop British soldiers from facing legal action for crimes more than 10 years old, but this had been delayed by Brexit. Sinn Féin spokesperson Linda Dillon said the legislation clearly showed the intent of the British government to cover up its crimes in Ireland. “From Bloody Sunday to the Ballymurphy massacre, Springhill, the New Lodge and in hundreds of other cases, the British Army were responsible for murder and mayhem on our streets,” she said. “Any attempt to absolve them from that is an affront to justice and an insult to grieving families who have spent decades campaigning for the truth. “It would also be a direct breach of the Stormont House Agreement which was signed up to by both governments and the political parties and provided for the establishment of legacy mechanisms to deal with the past. Meanwhile, British soldiers have sent a veiled threat to the leader of the British opposition Labour Party after he opposed an amnesty for killer soldiers. Jeremy Corbyn spoke out last month after it was reported that just one soldier involved in the Bloody Sunday massacre would face prosecution. “I don’t think we should have statutory limitations on this,” Mr Corbyn said. “We should have a fair and proper judicial process”. 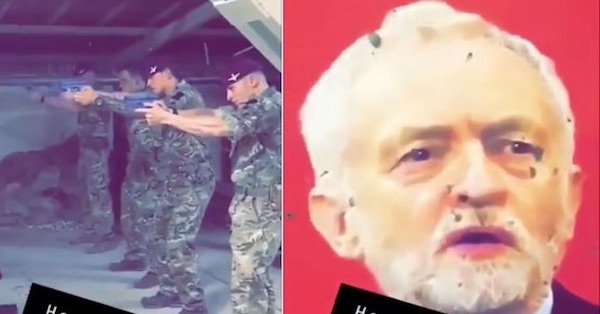 This week, in an apparent response, a video emerged of British soldiers firing at a target consisting of an image of Mr Corbyn’s head (pictured). In the video made in Afghanistan and shared on the internet, British Parachute Regiment soldiers, the same regiment involved in massacres in Ireland, were seen using the Labour leader as target practice on a firing range. The clip recalled previous displays of right-wing extremism by serving British soldiers and the murder of Labour MP Jo Cox by a fascist terrorist in June 2016.